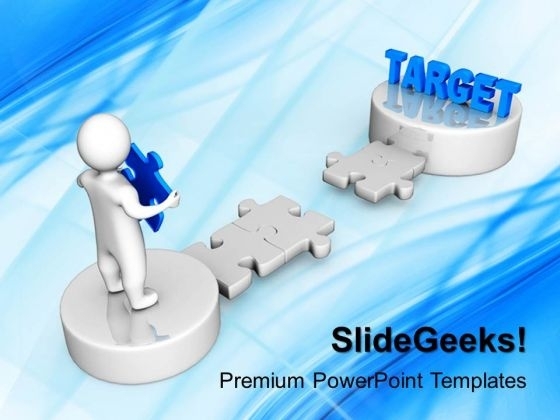 3D Man Carry A Puzzle With Target PowerPoint Templates And PowerPoint Themes 1012-Deliver amazing Presentations with our above template with a 3d man carrying jigsaw puzzle piece with word target. This image clearly defines the concept of achieving goals and target. This image has been conceived to enable you to emphatically communicate your ideas in your Business PPT presentations. This template signifies competitiveness, performance, marketing, management, objective, performance, strategy and success. Forward thinking is the way to go. Use our templates to emphasise your views.-3D Man Carry A Puzzle With Target PowerPoint Templates And PowerPoint Themes 1012-This PowerPoint template can be used for presentations relating to-"Man puzzle with targets, business, metaphor, success, targets, puzzles or jigsaws" Connect your audience with our 3d Man Carry A Puzzle With Target PowerPoint Templates And PowerPoint Themes 1012. Just download, type and present. Diversify plans with our 3d Man Carry A Puzzle With Target PowerPoint Templates And PowerPoint Themes 1012. Download without worries with our money back guaranteee.